Love it or hate it, it's the time of year when words like "wind chill" (ugh) and "Polar Vortex" (double ugh) are being thrown around left and right. I won't pretend I like it, you know me better than that, but I do try my best to embrace it by dressing in my coziest layers. One of my go-tos this time of year is my plaid flannel shirt, that's thin enough to layer but thick enough to keep me warm even on its own. I typically associate flannel shirts with more casual looks (90s grunge anyone?) but I like to dress up my flannel as well. With a bright red skirt, pearls, and boots, my plaid flannel skirt takes a walk on the dressier side. For a more casual look, I layered my plaid flannel shirt with this cozy new down vest, jeans, and ankle boots. 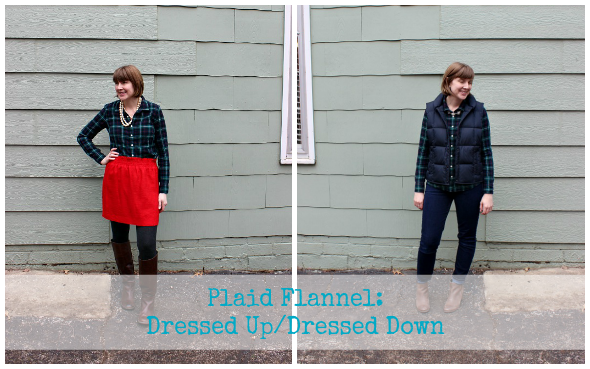 Flannel AND a down vest? Now I'm ready to take on the cold! Not that I'd mind a little warm up. How do you style your plaid flannel? Cute. I love your plaid shirt and I really like how you dressed it up with that pretty red skirt. I never think to dress up my plaid, but it works really well! Of course, your casual look is adorable, as well! Thanks!! I actually wore the "dressed up" look to Christmas Eve church and picked it because it looked holiday-ish. :) I usually gravitate towards more casual plaid looks too. I love this plaid top! Both of these looks are so cute, but I really like it with the pearls! I am SO tired of wind chill warnings too. And I'd like to start the day not having to warm the car for so long and scraping the windows! Love this plaid flannel top, the colors are great - looks good both dressed up and dressed down! Thanks Beth! I know it, I'm so sick of the cold. Between the child-bundling and the car-warming I feel like it takes forever just to get out of the house! Both looks are cute, but I love the outfit with the bright skirt and pearls. I remember Kansas City winters and the ice storms with no affection. They're some of the worse. Stay warm! I love both looks but the red skirt look is my favorite! Thank you!! :) That red skirt was a good investment! Love plaid shirts + skirts, and yours is even better because it's a red skirt! So cute. And your vest is great! A classic winter look. I have a super similar one from Old Navy from years ago that I still wear all the time, over everything, around the house. Some outfits end up looking kinda ridiculous... but yours is really cute :) I always love adding a little sparkle to plaid with necklaces like this too! I know - that's why I ended up getting a second one this season, that's a little less bulky, but warmth is the tradeoff, which is why I end up wearing the puffy black one more around the house... I agree on the retro vibe though, and I love that. You'll be able to use it as a great accent for all kinds of outfits! I hope so! I actually have a pink version that's thinner that I got a few years ago at Old Navy, but pink = not the most versatile color ever (it's pretty bright) so it's in my clothing-limbo area in my basement :) So navy blue puffier version it is! I love the outfits! The plaid looks so cute on you! Also, I love that jcrew skirt, I have it in tan and black! Thanks Melanie!! This is such a great skirt, I wish I would have picked up another color as well! I like your sensible take on warm winter dressing - no exposed skin! I get so frustrated when I see people all bundled up, but with bare legs. Thanks for providing practical winter style inspiration! Thank you, I appreciate that! I'm too much of a weenie to have exposed skin this time of year, I don't know how people do it. Although when it warms up a little I do give my feet a break from the boots and wear flats and no socks if I can stand it!